Mario Bros. is a title for the Game & Watch. Despite its name, it has no similarity to the popular arcade game Mario Bros. Instead of plumbing, Mario and Luigi are working at a bottling factory and must prepare packages of bottles to load onto a delivery truck. This is the first game to feature Luigi. The game is played on the Multi Screen model of the Game & Watch and was released on March 14, 1983. The model opened like a book and could allow for simultaneous two-player action, with one player controlling Luigi on the left half of the game and the other playing as Mario on the right, making it the very first Mario game to have two-player mode. The game is featured in the Gallery Corner in Game & Watch Gallery. It was later remade for Game & Watch Gallery 3 and Game & Watch Gallery 4, both of which feature a Classic version and an updated "Modern" version of the game. Mario must first take a pallet out of the machine on the lowest level and place it on the lowest of five conveyor belts running in alternating directions. A bottle is placed on the pallet as it passes through the divisor between the screens and continues on until it reaches the end of the conveyor belt. Here, Luigi must take the package and place it on the above conveyor belt, which takes it back to Mario, who sends it back to Luigi on the next conveyor belt. Luigi sends it back again, and Mario has to put it on the highest conveyor belt, where it is sealed while passing through the column. Luigi then throws the sealed package onto the delivery truck, which eventually gets filled up and leaves, giving Mario and Luigi a brief break until it returns empty. The player earns a point for every pallet moved to a higher conveyor belt and for every package thrown onto the truck. They earn ten points after every time the truck is fully loaded with eight packages. There is no end to the game, but the conveyor belts get faster, and the number of pallets on the screen increases as time goes by, forcing Mario and Luigi to scramble up and down the ladders in order to prevent the packages from falling off the ends of the belts. Each time this happens, the Mario Bros. get yelled at by their boss, giving the player a miss. After three misses, it is Game Over. If the player manages to score 300 points without a single miss, the points that are earned will be doubled until the player does get a miss. If a miss is earned before scoring 300 points, all misses will be cleared instead. 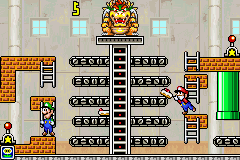 The Modern version of the game has many changes: Mario and Luigi are working in an outdoor cake factory, Wario drives the delivery truck, and Bowser periodically ground-pounds the top of the packing machine to reverse the directions of the conveyor belts, forcing either Mario or Luigi to flip one of two switches at the bottom or top of the screen to switch them back to normal. In this version, the player earns three points for every cake thrown onto the truck. Plus, if the player fully loads the truck five times without getting a miss, they will earn 30 points. When a cake falls and breaks, rather than having their boss yell at them, Mario and Luigi will each just make a face of dismay. At 200, 500, and 700 points, a Heart will appear for the Mario Bros. to remove a miss. Music is also featured, with the tempo changing depending on the speed of the game. The game reappears as a secondary game in Game & Watch Gallery 4. It largely has the same premise as in Game & Watch Gallery 3, except that the Mario characters are working in an indoor cake factory. Also, the player will earn only 20 points if they fully load the truck five times without getting a miss. If the player selects the game in Game & Watch Gallery 4 yet waits a few moments, a humorous sequence will play. In it, Mario and Luigi are washing the pickup truck for deliveries, only for both Wario and Bowser to carjack it just as they finished cleaning it, much to the Mario Bros.' dismay. Mr. Game & Watch's forward-aerial attack in the Super Smash Bros. series involves swinging a package, much like Mario and Luigi do in this game. Additionally, Mr. Game & Watch's down taunt in Super Smash Bros. for Nintendo 3DS / Wii U and Super Smash Bros. Ultimate is based on Mario and Luigi's animation after finishing a level. This page was last edited on April 22, 2019, at 22:51.